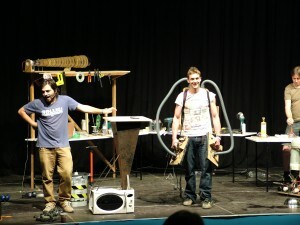 In this podcast, recorded at the Abu Dhabi Science Festival 2013, Jem Stansfield and I talk about his show here, and how there is an incredible amount of story telling when it comes to designing a demonstration. Ever designed a demonstration? Or even just tinkered in your shed to make something? Jem Stansfield, currently one of the presenters on BBC Bang Goes The Theory, does this for a living. Making things is what Jem does. Starting out working backstage on Scrapheap Challenge, he has built a plethora of things: cars fueled by coffee, a jet-pack to propel him all the way around a swing, a giant super-sonic vortex canon, and many more wonderful things! Just like science, there is a method that Jem uses to build his demos: think first, talk about it, build rough prototypes to test your thinking and then scale up. And this is what he tries to bring to the audience in his shows. Jem is unusual however, in that he tries to use the internet as little as possible when it comes to researching his ideas. He uses people instead. After coming up with an idea, and sometimes having thought about it for a year, he will trial the idea on his friends, and see what it is about the idea that catches their imagination. Sometimes, it is even a misheard concept that ends up becoming the final model. With a background in aeronautical engineering, Jem has an incredible trust in maths. So once the ideas have been trialled on people, he starts doing calculations. Sometimes, he then takes his ideas to researchers around the world: It is these opportunities to visit some of the greatest minds for TV shows that keeps him in the business. But unfortunately, he is not always able to. When working in TV, there are very tight deadlines. Sometimes, Jem only has one day to design, test and build something in 1 day. He build an iceboat for a TV show, and spend 3 100hour weeks working full time on it. But even he knows that there is only so much maths you can do to design the demo, but it’s also about plucking up the courage to test it too! We also talk about how Jem first got into this industry, and his first introduction to presenting TV shows by looking at the development of TV shows. During his final year, Jem was looking at how satellites would be able to withstand small meteor impacts. He ended up working with the technicians that helped build his models. And he found that they knew more about engineering and building than the lecturers who were teaching him. It is having that hands-on experience, and the trust that these people have in their senses of how things work that Jem fell in love with. I really enjoyed meeting Jem Stansfield – I hope you enjoy this chat.